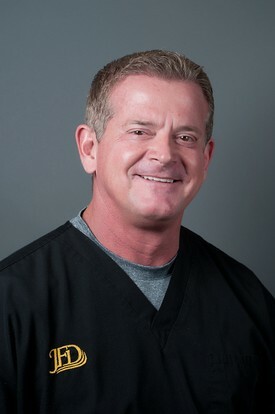 Roger L. Jackson, DDS is a native of California. Growing up in the Los Angeles area, Dr. Jackson enjoyed surfing and riding dirt bikes. After high school, he attended Loyola Marymount University in Los Angeles and earned degrees in biology and chemistry. He then attended dental school at Creighton University in Omaha, Nebraska, where he received his DDS degree in 1987. Following dental school, Dr. Jackson moved to Boulder, Colorado where he began practicing dentistry. In 1997, he and his family decided that the long Colorado winters were just a bit too much, and they relocated to Fountain Hills, Arizona. He has been practicing dentistry in the Scottsdale community ever since and established Jackson Family Dental (formerly Desert Breeze Family Dental) in 1999. Dr. Jackson pursued advanced training in cosmetic dentistry at the Las Vegas Institute for Advanced Dental Studies, where he completed a mini-residency program in dental implants. To schedule an appointment with our Scottsdale Dentist, call Jackson Family Dental at (480) 860-9700 or request your appointment today.